Cosy country house with garden, completely surrounded by nature and vineyards with stunning view over Monferrato’s hills (declared a UNESCO Human Heritage site) and the Italian Alps in the background. The house accommodates 6 people and it is excellent for families. The location ensures privacy and a relaxing stay. There is a private parking. The farmhouse, about 97 square meters, is rustic, bright, fully furnished and well equipped to enjoy the typical country atmosphere. It is organized on two floors. - a newly renovated bathroom with shower. - bathroom with tiny bathtub (that can be used as a shower) and hairdryer. A flight of stairs leads to first floor. There is a safety gate for children. The garden is ideal for dining, relaxing, enjoying the great views, living close to nature surrounded by vineyards and majestic hills. The outdoor area is equipped with: table and chairs, porch swing, deckchairs, hammock and swing for children. There is a private parking that accommodates two cars and a garage for bicycles is available on request. - bedroom 2: kingsize bed + single bed + travel crib. - water, power and gas usage. - Absolutely must enjoy your stay! Please feel free to contact us if anything is needed via phone, email, text message. 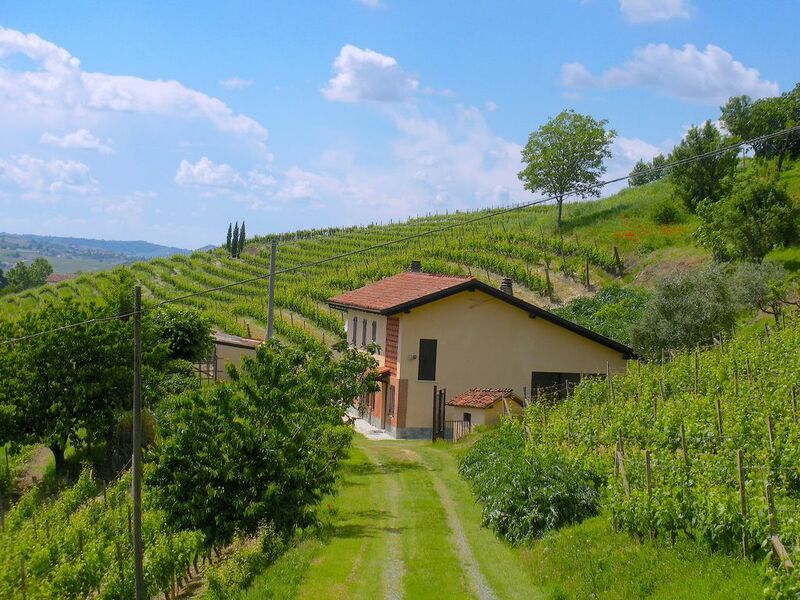 Nizza Monferrato is a great starting point for visiting the Langhe-Roero and Monferrato area, declared in 2014 a UNESCO Human Heritage site for its vineyard landscapes: surrounded by beautiful and carefully cultivated hillsides, antique towns, castles, ect. For sport lovers the place is ideal for awesome bike, running and hiking routes through Langhe and Monferrato. I was born and raised in this farmhouse; I’ve devoted my life to my family and work, now I’m retired. My wife Ernestina and I have decided to share with our guests our love for this house, for the nature and for the stunning hills where we live. We hope to see you soon! The farmhouse is 3 km away from the center of Nizza Monferrato - where you can find all the facilities - in the heart of the Piemonte wine area: Langhe and Monferrato. Its position is a great starting point for visiting the Langhe-Roero and Monferrato area, declared in 2014 a UNESCO Human Heritage site for its vineyard landscapes. This UNESCO site covers five distinct winegrowing areas and one castle, emblem of profound and ancient expertise reflecting the relationship of man with his environment. They express a slowly refined association between a diverse range of soil types, grape varieties that are often native, and suitable winemaking processes. They offer panoramas of carefully cultivated hillsides, following ancient land divisions punctuated by buildings which provide structure to the visual space: hilltop villages, castles, Romanesque chapels, farms, ciabots, cellars and storerooms for the cellaring and sale of wine, notably in the small and larger towns on the margins of the vineyards. The site is outstanding for its harmony and balance between the aesthetic qualities of its landscapes, the architectural and historic diversity of the built elements associated with the vineyards and viticulture, and an authentic and ancient art of winemaking.